Dubbed “the most beautiful roadway in America” by On the Road correspondent Charles Kuralt, the Beartooth Highway climbs to an astounding 10,947 feet above sea level. Since its completion in 1936, the Highway has awed millions of visitors with its astonishing views of one of the most rugged and wild areas in the lower 48 states. As it winds its way from the northeastern entrance of Yellowstone National Park to Red Lodge, the Highway traverses an impressive range of ecosystems – from lush lodge pole pine forests to alpine tundra. At the highway’s summit, travelers find themselves in a sky-high world of glacial cirques, clear alpine lakes, and snow that lingers through the summer months. The brutal climate at this elevation deters the growth of trees and shrubs, and the plants that do grow here have adapted in remarkable ways. Some convert sunlight to heat, and many conserve water the way desert plants do. In late June and July, the fragile tundra blossoms in a lavish display of wildflowers – shooting stars, columbine, and Indian paintbrush, to name a few. With 20 peaks over 12,000 feet in elevation (including Granite Peak, Montana’s highest at 12,799 feet), the Beartooth Mountains lie within the 943,377-acre Absaroka-Beartooth Wilderness. Grizzly and black bears make their home here, as do elk, deer, moose, bighorn sheep, Rocky Mountain goats, mountain lions and bobcats. With over 950 alpine lakes and hundreds of miles of trails, these mountains offer ample opportunities for recreation – much of it accessible from the Beartooth Highway. Plan on at least three hours driving time to make the trip between Yellowstone and Red Lodge – more if you really want to experience the beauty of the Absaroka-Beartooth Range. Whether or not you plan to stop and explore a while on your way, be sure to pack your windbreaker and woolens for the trip: it can be a bit nippy at the summit of Yellowstone’s own Highway to the Sky. When you’re making your travel plans, remember that due to extreme conditions, the highway is only open Memorial Day weekend through early October. Contact the US Forest Service at 406-446-2103 or the Red Lodge Visitor’s Center at 888-281-0625 for opening and closing dates. 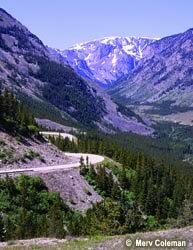 WHY IT’S GREAT: This stretch of U.S. Highway 212 between Red Lodge and Cooke City, Montana zigzags across the Montana-Wyoming border through a series of steep switchbacks, rising from about 5,000 feet to 10,947 feet at the Beartooth Pass. It’s so high that it’s closed in winter due to snow, but in the summer months offers the best motorcycling in the country.